← Who do you play for? I’ve listened to Boston sports radio this week and the chatter around the rinks, most people around here are agreeing with the NHL’s decision not to fine or suspend Chara. I understand their point of view. Most say it was just the spot in the rink where he got hit, that they should fine the architect of the rink if anyone. Two seconds later, none of this would have happened. If football is a game of inches, hockey is a game of seconds. There was a lot of bad luck involved here. As a child of the Cold War, I do find it a bit ironic that my boys cheer for the 6’9 Czech player. 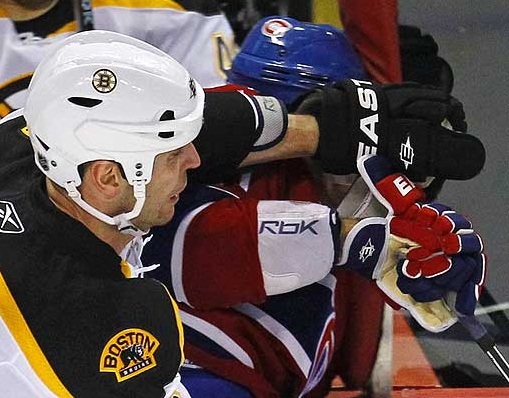 When I was a little girl I would have been afraid of Zdeno. He would have reminded me of the opponont in Rocky IV! I guess I should be grateful my kids live in a different time, and that they are loyal to their hero. But I’m a mom. Max Pacioretty is a 22 year old kid from Connecticut…just a couple of hours down the road. He’s living my boys’ dream, and this was a reminder of how quickly a little boys dream can turn into a mom’s nightmare. I know a couple of little hockey players named Max and I can’t help but see their heads going into that stanchion when I see this picture. A mom’s advice to the NHL and the Canadian Mounties, if they are reading: Be consistent. Pick a rule and stick with it. If my daughter hits her brother and it doesn’t hurt, but then he hits her back and she is crying, they still need to be punished equally. It’s the hit I’m punishing not the hurt. And lastly, to Zdeno- play nice, my boys are looking (way) up to you! This entry was posted in Uncategorized and tagged Boston Bruins, hockey mom, Max Pacioretty, Montreal Canadiens, NHL, parenting boys, Zdeno Chara. Bookmark the permalink.